Interestingly I saw today that Coravin have come out with special screw cap topper things. It looks as though you de-cap the wine and put the Coravin cap on, it has a membrane that you puncture as with a regular cork and enables you to keep screwcap wine and “access” it over several months (if they are to be believed). Something I should have thought about before, but has been invaluable for the “wrong” reasons, is my steel port filter. Bought this for removing the last drops of delicious port from sediment, but I have probably used it more (as I did last night) to filter out cork bits from a wine bottle where an old cork crumbled and couldn’t be pulled out, so the remnants had to be pushed into the bottle. I have bid on eBay and purchased a number of brand new (cellophane wrapping intact) Le Creuset Screwpull models for myself and Christmas gifts for friends. Some retail for up to £100 but if you are lucky you can pick one up for £20, although £10 was my record. I do like decanters and a plain glass or even a modern Dartington crystal decanter can be picked up for a tenner. Not a fan of the old, heavy cut glass or crystal ones, they can be picked up on auction for virtually nothing. If you are interested, then now or in the New Year when unwanted, wine related Christmas presents abound is the time to buy! My logic is that all these things including glasses can cost quite a bit and can wear out or in the case of glass, chip or break. Are you bothered about 2nd hand glasses? Well they tend to be new off eBay, but we drink out of “not new” glasses in pubs and restaurants and all my purchased stuff goes through a dishwasher twice!! Then rinsed in Asda Spring Water to get rid of Surfactant residue. If not removed, can effect the surface tension in a liquid such as still wine or Champagne. No point in paying good money for a wine and a well designed glass to drink it out of, and then have dishwasher tablet or washing up liquid residue impinge on the taste and aroma. I’m not much on gadgets apart from the usual collection of several styles of corkscrew - even though I use a couple of Waiter’s Friends almost exclusively. I do want a Coravin someday, but at the moment not sure I’ve got the wines that justify it! I did sign up on Kickstarter for a new decanter/pourer/preserver device called ETO, hope to see that in use some time in the New Year. The other thing I use a lot is a WineYoke (http://wineyoke.com/ bought through Amazon) for walk-about tastings, very useful for note-taking, even if a friend of mine claims it looks like a Gimp mask. I think Vacuvin is worse than useless. It’s obvious that they do not and cannot create a vacuum, and thus spoiling oxygen remains in the bottle, but worse than that the pumping action ‘scalps’ the wine, removing bouquet, and the seal sometimes leave a rubbery tang to the wine. 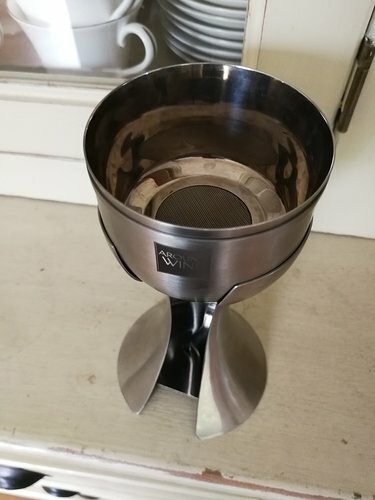 I hate seeing them used in bars/restaurants/pubs when ordering just a glass of wine as the establishments seem to think the device will keep opened wine fresh indefinitely and should one have the temerity to suggest the wine is dead they will say it cannot be as they use Vacuvin. I used to have (and probably one still at the back of a drawer) the pump device for removing corks. You insert the hollow neede through cork and pump vigorously forcing air into the bottle until the increased pressure forces the cork out. Problem is that if there is a weak spot or fault in the glass of the bottle then it could shatter, at best spilling the wine, at worse cutting the hand holding the bottle. And the air pressure must build up under the cork, so odd shaped bottles such as bocksbottles, Mateus Rose and the like should not be given the treatment. Such bottles are warned against in the instructions that come with the device but tend to get forgotten,. -A decent waiters friend corkscrew - with teflon coated screw, flanged lever and serrated knife blade. Completely eliminate the problem of wine splashes on tables and tablecloths when pouring from any size of bottle. Roll up the disc, insert into an opened bottle and pour. Pack contains two discs which are washable and reusable. I have a Coravin that gets occasional use - mostly if I am just catering for myself on a Friday or Saturday evening and fancy a glass or two, or for desert wines. Last year I did visit a store where they were demonstrating an Isommelier and providing samples of wine to try both before and after being ‘decanted’ by the machine and the results certainly did seem positive, though at an eye watering £1000, however I believe they have now come out with a slightly less expensive version. Having December birthdays isn’t all that bad after all !! The postmans just been and I’m BEYOND excited …! I am very excited about ETO coming out next year. I think it’ll be one of the most successful inventions for wine drinking. eto | a beautiful innovation in wine preservation. Elegant wine decanter with unique, patented system that keeps your wine tasting perfectly fresh. LIVE on Kickstater 6th June. I saw this a while back, looks great, I guess its kinda the same as decanting a partly drunk bottle into a small half bottle. … but I haven’t tested its effectiveness over more than a couple of days - and on that basis I wonder if it really makes any difference. How long might the remaining wine be expected to last? I guess the wine left in the bottle was aerated with the first few glugs, and although it might taste better over the next few days, beyond that it would start to deteriorate. The Coravin would cleverly avoid this by not allowing any air in at all (but sadly I can’t justify one of those). I was very interested to hear about the ETO product (thanks for sharing that @Rich29 ). But surely this would suffer from the same theoretical weakness as the argon gas Wine Preserver - because it allows air contact when it is first decanted? I should do a proper, more controlled test, but when it comes to wine drinking ‘control’ is pretty low on the agenda!! What do the more experienced wine drinkers think? because it allows air contact when it is first decanted? That’s my understanding. As soon as wine is opened it starts bonding with oxygen. Pouring from one container to another thoroughly oxygenates the wine. Scientist Jamie Goode has written on this several times. The Coravin - which protects the wine from oxygen - has its afficiandos, but there are also some critical comments from users on the wine discussion boards. Seems to depend on how often one uses it on the same bottle, since the needle uses the same place on the cork to pierce. And not only costly to buy, but also to run. Need very expensive rare wines to make it worthwhile - if it works for you. Yes somebody bought me a case of their ‘powerful reds’. Alcoholic Ribena. The argentinian Shiraz Malbec blend was alright, the rest was poor. Felt a lot of effort had gone into the labels, possibly more than selecting the wine. What is this thing you call “Left Over” Wine? I’ve never heard of that particular bottle. Doesn’t sound very appealing. I liked the look of the ETO as much as its potential use (plus the creators are based in Wales), hopefully it will live up to the hype!